Leonato (David McCann), Margaret (Olivia Saccomanno) and Ursula (Khetanya Henderson) are entertained by Beatrice (Sarah Wintermeyer). Photo: Gerry Goodstein..
OK, I admit it. In a season during which I already have seen eight Shakespeare plays, I wasn’t sure I was looking forward to a ninth. Don’t get me wrong. I’m a big Shakespeare lover, but some of the interpretations can leave me out, out, damn spot” to the image on my eyes or the pain in my ears when Romeo is wearing red sneakers, or the iambic pentameter sounds more like the stilted reading off the page of a book. And, well, eight in one season is kind of a lot of Shakespeare. 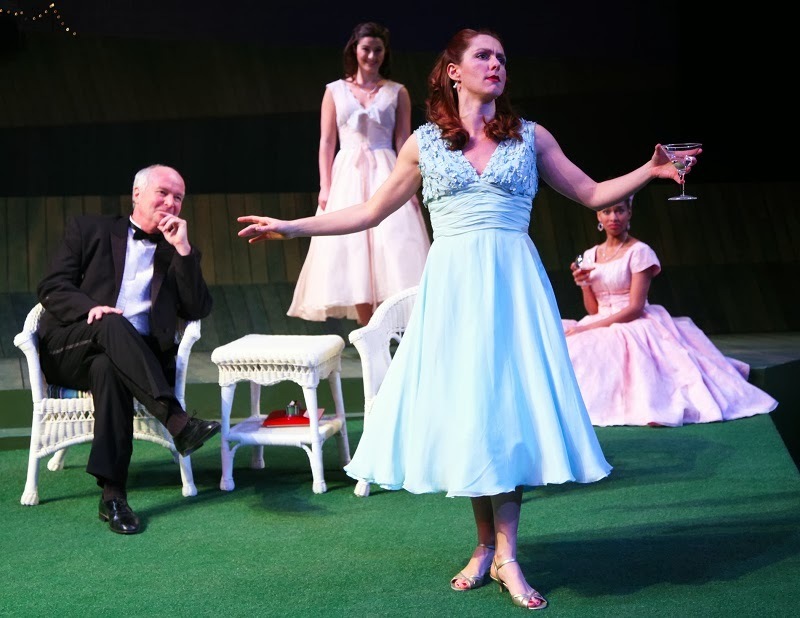 So when the ninth was Much Ado About Nothing at CT Repertory set in the 1950s with only two Equity actors leading a cast of UConn theater students, I was wary. I’m so glad I went, though. This show is a fresh breath of Elizabethan air. This production, helmed by Paul Mullins, is delightful in every way, with wonderfully full portrayals, a fanciful set (designed by Joe Keener III) and costumes (designed by Tiffany Delligatti) that are to die for. With Frank Sinatra on the radio, soldiers returning home from the Korean Conflict, arrive at a Newport, RI estate where romantic involvements and entanglements ensue. Wooden walkways take folks along the green walkways and putting greens of the estate of Leonato (veteran stage actor David McCann) while a 3-D miniature mansion, complete with twinkling lights, provides the backdrop. Leonato’s niece, and Benedick (James Jelkin), one of the returning soldiers, apparently can’t stand each other and enter into witty, sharp-tongued barbs to communicate. Benedick’s companion, Claudio (Colby Lewis) is enamored with Leonato’s daughter, Hero (Briana Maia) and declares his intention to marry her. Benedick, not a fan of marriage, tries to dissuade his friend, but their other companion, Don Pedro (Anthony J. Goes, the other Equity actor in the production) is all for it, prompting his scornful illegitimate brother, Don John (Will Haden), to scheme to destroy the happiness of his friends. Hero’s reputation is impugned leading to problems with the planned marriage. The events of the day cause Beatrice and Benedick to realize the true nature of their feelings for each other, however. It’s a light, fun play without the tragedy or ridiculous disguises used in some of Shakespeare’s other plays and it’s done so well here. Wintermeyer and Jelkin have marvelous rapport so their banter is a fine-edged sword. They also connect with the audience through humor and facial expressions. Choreography by Gerry McIntyre enhances Mullins’ staging so that the show feels like a dance between merriment, poetry and humor. The costumes play out that theme, with lovely, flowing lines, delicate prints and designs that create different looks for individual actors while uniting a scene. The constables of the watch, dressed in Park-Ranger-looking uniforms, and conspirators on the putting green, lend much humor. Kudos. Each cast member expertly delivers lines in the right meter – which is more than I can say for some of the Broadway Shakespeare I have heard this season. CT Rep can make a big to-do about this Much Ado. Rounding out the ensemble are: Thomas Brazzle, Darek Burkowski, Khetanya Henderson, Olivia Saccomanno, , Saul Alvarez, Gabriel Aprea, Harry Elfenbaum, Kevin Hilversum, Alison Janavaris, John Manning, Ryan Marcone, JoonHo Oh, Susannah Resnikoff, and Adam Schneemann. Much Ado plays at Ct Repertory's Nafe Katter Theatre on the Storrs campus through March 9. Perfromances are Wednesday and Thursday, 7:30 pm; Friday and Saturday at 8 pm; Sunday at 2 pm. Tickets $6-$30; (860) 486-2113; www.ct.uconn.edu.